The Lerner paradox is the possibility that a tariff on an import good might worsen a country's terms of trade, and the Metzler paradox is the possibility that a tariff on an import good might reduce a country's import price. 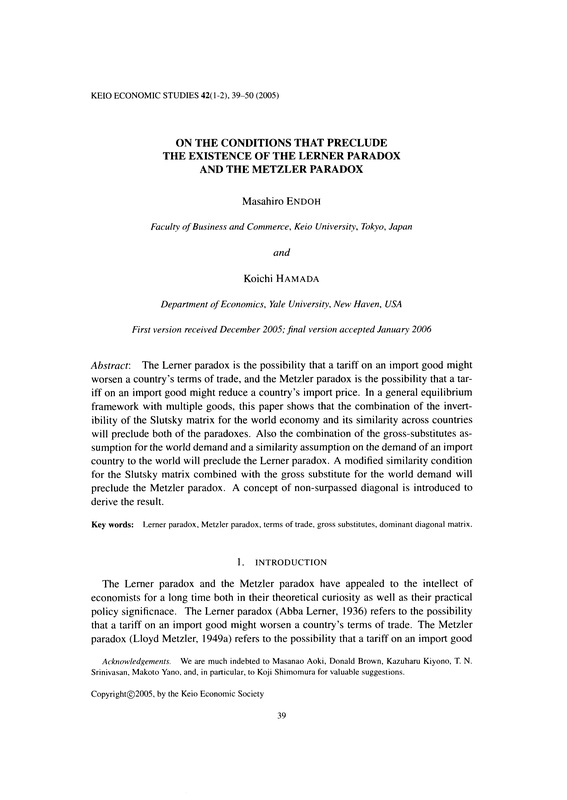 In a general equilibrium framework with multiple goods, this paper shows that the combination of the invertibility of the Slutsky matrix for the world economy and its similarity across countries will preclude both of the paradoxes. Also the combination of the gross-substitutes assumption for the world demand and a similarity assumption on the demand of an import country to the world will preclude the Lerner paradox. A modified similarity condition for the Slutsky matrix combined with the gross substitute for the world demand will preclude the Metzler paradox. A concept of non-surpassed diagonal is introduced to derive the result.